A new web application called SoundBetter aims to make recording music, and making it sound, ahem, better, with a game-like interface. Music rhythm videogames are branching more and more into the creation of music instead of just consuming it. Programs like the Rock Band Network and the latest round of music games concentrating on bridging the gap between playing a game and playing a real instrument. User-created content is also a huge buzzword right now as evidenced by the Minecraft craze, the success of games like Little Big Planet, and the continued popularity of YouTube. All of the pieces seem to be in place for an application that would allow you to record and manipulate your voice, add backing tracks and function like a professional studio all with easily accessible game-like elements. And that's exactly what Music Mastermind's SoundBetter will provide. Once you have your masterpiece, SoundBetter will let you share your composition with the masses. "We're at the forefront of the next evolution of music entertainment, and it's time to break down the barriers that prevent people from expressing themselves musically," said Matt Serletic, CEO of Music Mastermind. 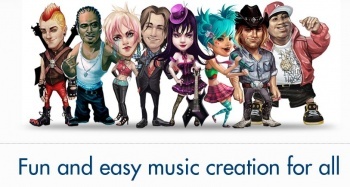 "This company is all about fun and easy music creation for everyone. All people love music, and now absolutely anyone can produce great sounding songs to enjoy and share with the world." Music Mastermind has a lot of star power behind it. Serletic himself is a Grammy Award-winning producer and used to head up Virgin Records. He heads up a group developing SoundBetter which includes 30 people with backgrounds from sound engineering and music theory to technology and game development. In fact, the team has over 33 game credits on titles like Guitar Hero and Tony Hawk. The prospect of simplifying audio recording and editing into something that anybody can do is exciting. Of course, not everyone will be talented enough to produce the next hit, but if YouTube is any indication, sometimes providing the platform is all that's needed. Sure, most of the stuff on YouTube is crap, but sheer number assures that an honest gem might make its way to the surface. I look forward to hearing more from SoundBetter and Music Mastermind. The team seems to have the know-how to implement something like this, and we've been promised more information in the next few weeks. It could the next big user-created content platform, or it could totally bust. But at least I'm paying attention.